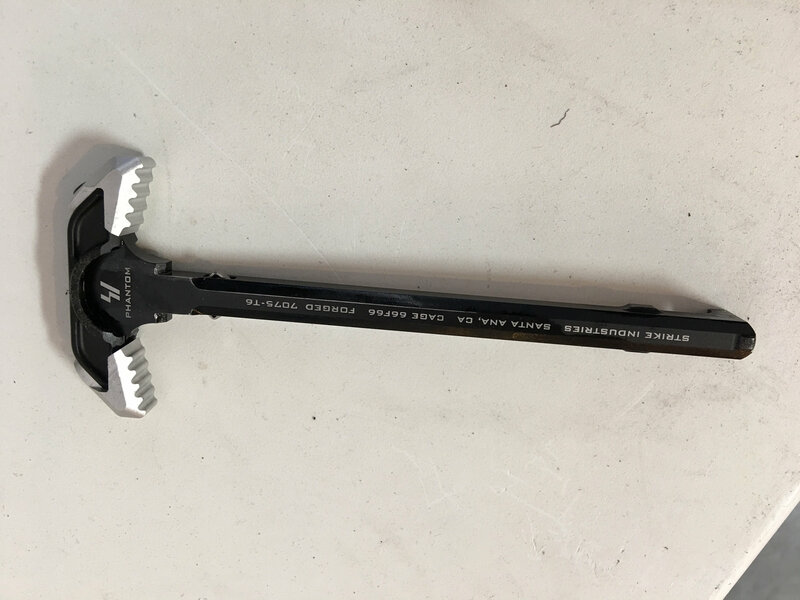 Strike Industries SI Phantom Latchless Ambidextrous (Ambi) Charging Handle with new SI ISO Tabs for Enhanced Combat/Tactical Weapon Ergonomics! (Video!) | DefenseReview.com (DR): An online tactical technology and military defense technology magazine with particular focus on the latest and greatest tactical firearms news (tactical gun news), tactical gear news and tactical shooting news. 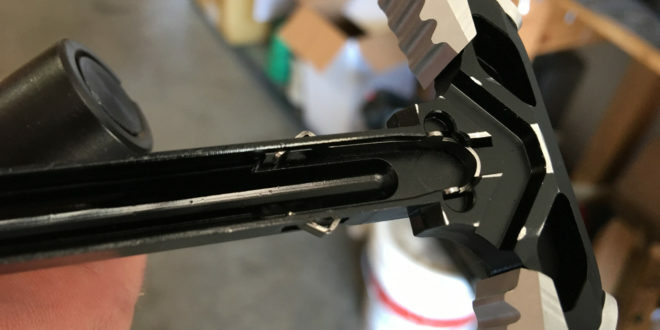 As long as we’re covering cool new combat/tactical AR (AR-15)/M4/M4A1 Carbine components, DefenseReview (DR) should definitely also discuss the Strike Industries SI Phantom Latchless Ambidextrous (Ambi) Charging Handle, which is going to be available with SI ISO Tabs for ergonomic enhancement, within the next 2-3 months. While the embedded photos and video show the Isotabs in the white, you’ll be able to order the Isotabs in the same color as your Phantom (or a different color, if you’d prefer). Design-wise, the Phantom’s main claim to fame is that, thanks to the latchless aspect, it’s simpler in design, and quicker and easier to operate ambidextrously than a normal ambi charging handle. The ony caveat is that it’s currently only compatible with unsuppressed 14.5″+-barreled carbines and rifles. 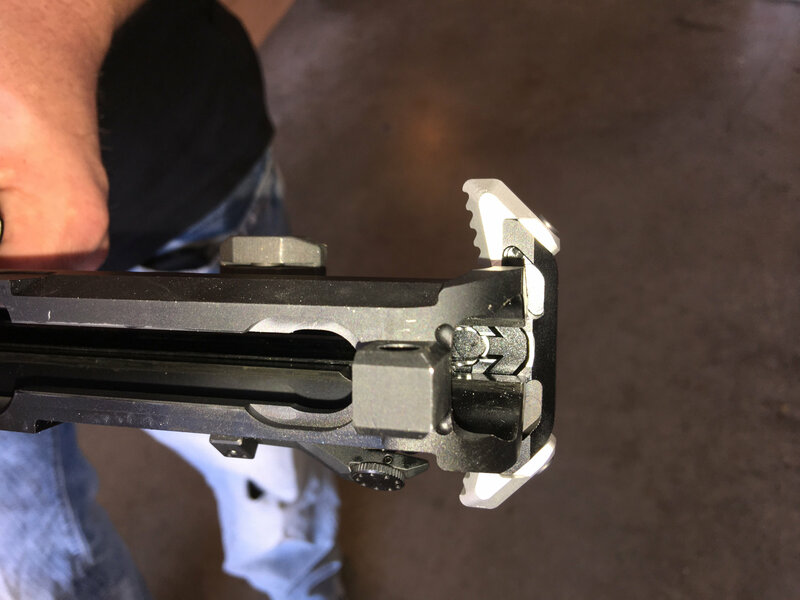 It can’t be used on SBR’s (Short Barreled Rifles) or suppressed guns, since the hidden detent locking spring can’t handle the additional back-pressure they create. However, that will eventually change, as Strike Industries is developing a variant that will be SBR and silencer/suppressor-compatible–but you’ll have to wait. It’s (SBR/suppressor-variant Phantom) probably at least a year out. 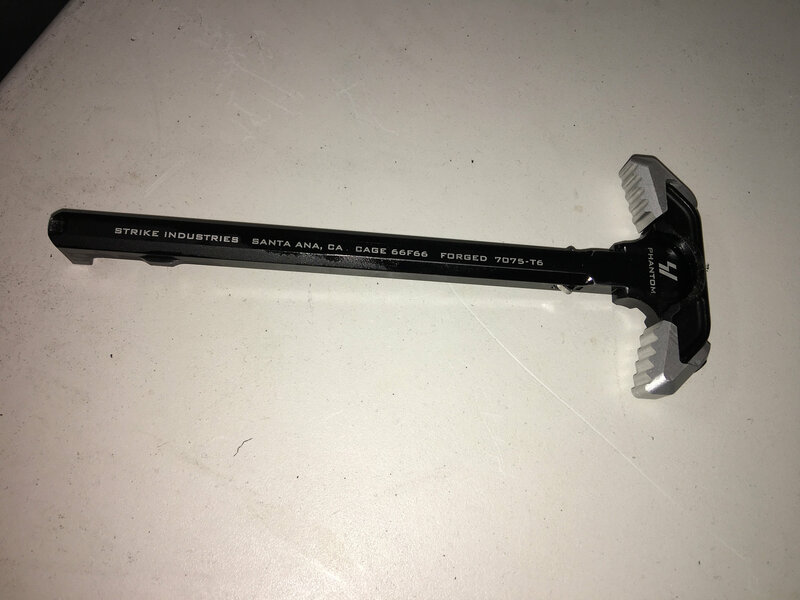 Anyway, the SI Phantom Latchless Ambi Charging Handle is made from forged 7075-T6 forged aluminum, and the hidden flat spring bearing surface is “much larger than a steel ball bearing, spreading force and wear out over a larger area”, which should result in increased service life over a traditional ambi charging handle with latches. The latchless design basically mitigates the Phantom’s likelihood of breaking, snagging or jamming, provided there’s no gas overpressure from a suppressor or a barrel that’s too short. The Phantom is a really interesting design, and crazy-simple. Oh, and it’s only $35.95 USD MSRP (as of this writing). Colors are Black, Red, and Grey. But, back to the ISO Tabs. As far as DR’s aware, we’re the only ones that have actually photo’d and filmed them in action on the Phantom. So, enjoy. 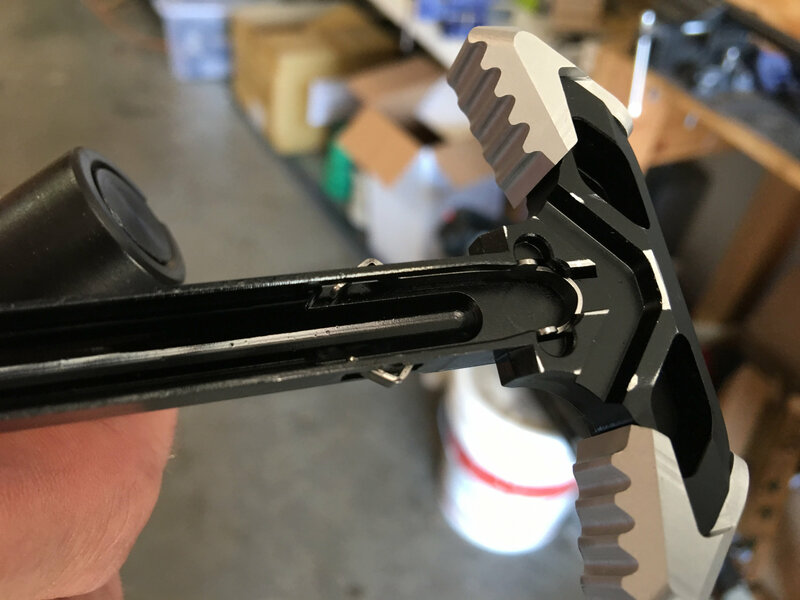 Hopefully, we can get a SI Phantom Latchless Ambidextrous (Ambi) Charging Handle and ISO Tabs into Defense Review writer contributor and chief new-product tester Jeff Gurwitch’s hands for some serious T&E very soon. If he says it’s good to go, it’s good to go. Jeff recently reviewed the SI Sidewinder BUIS 45-Degree-Offset Flip-Up Back-Up Iron Sights for us, and really dug ’em. 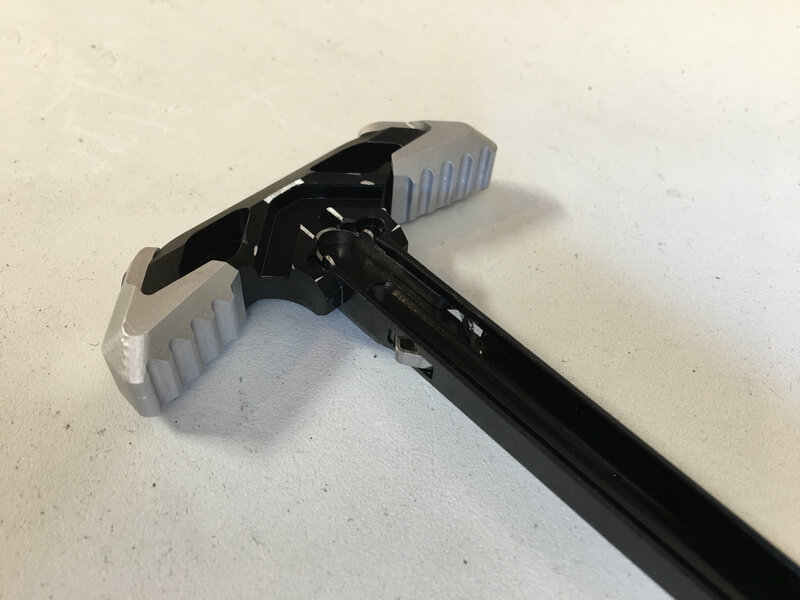 The SI Phantom Charging Handle represents yet another step forward for the AR 15. Simple in its execution, yet robust and reliable, the revolutionary SI Phantom-CH offers forged 7075 construction, efficient side gas venting, and a solid, comfortable interface for the user. 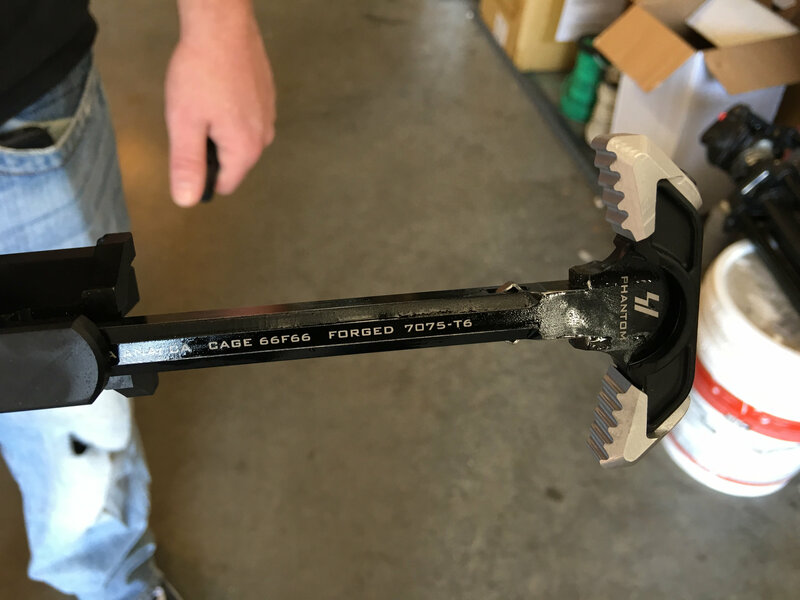 Reliable receiver lockup is achieved through a novel hidden spring mechanism that uses the Charging Handle insertion slot in the upper receiver charging handle channel. 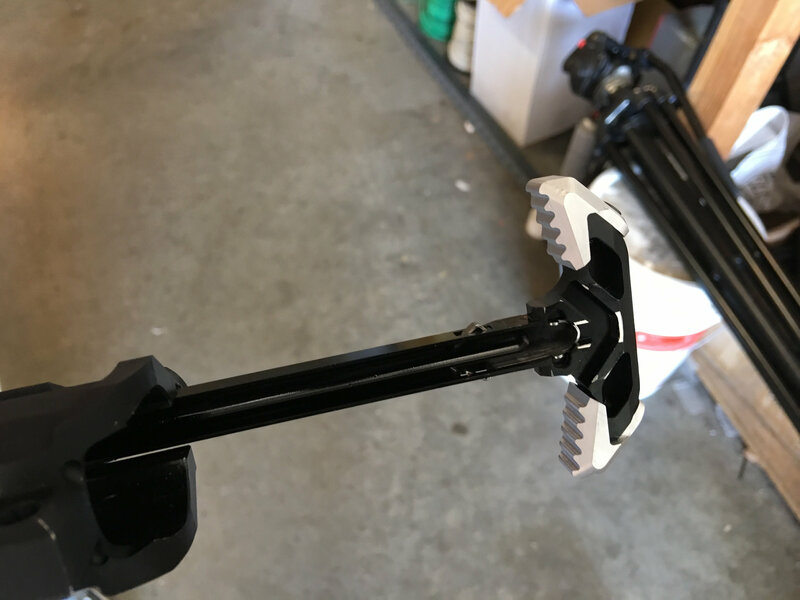 The SI Phantom Charging Handle represents yet another step forward for the AR 15. Simple in its execution, yet robust and reliable, the revolutionary SI Phantom-CH offers forged 7075 construction, efficient side gas venting, and a solid, comfortable interface for the user. 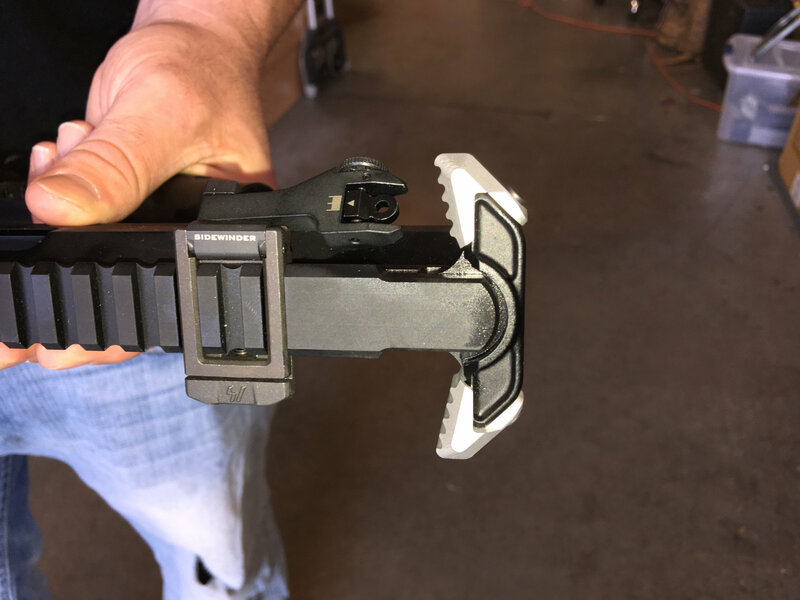 Reliable receiver lockup is achieved through a novel hidden spring mechanism that uses the Charging Handle insertion slot in the upper receiver charging handle channel. This channel features a natural radius that will not wear rapidly like the external, 90-degree edge of the standard CH latch area of the upper receiver. The flat spring bearing surface is much larger than a steel ball bearing, spreading force and wear out over a larger area. Increased service life is one benefit of this type of system, as is the comfort and peace of mind that come from a lack of moving or external components that can break or snag/catch on your gear and foreign objects. The solid aluminum construction is durable and provides a solid mounting point for the ISO Tabs, an add-on component that increases surface area for those using large optics and/or gloved hands. – Improved service life over competing designs. – Simple, sleek, snag free design. – 7075 Forged Aluminum Construction.